If you're looking for something to take the mystery out of 'blogs' and not make your eyes glaze over with technical jargon, check out Blogging With Moxie by Joelle Reeder and Katherine Scoleri. Registration is now open for the February/March Live Staging Diva TeleClasses. I only take 15 students in a conference call. All notes are emailed to you in advance. You get a phone number and password to join your fellow students and me in the live calls on the 5 designated evenings. Next live courses start Feb. 20 and end March 5. Look for a trainer that has a proven track record of success as a home stager. January was not an easy month. The good news is my mother's cancer is gone. But I ended the month attending the funeral of my 44-year-old cousin after watching her steady decline in the 8 months since she got her own cancer diagnosis. Less than a year ago, she was at the peak of her career and had just returned from a white water rafting trip with her husband and two kids. Attending the funeral this week and listening to everyone, I have never been clearer that we have to grab hold of our lives and live them to the fullest. Not later, but now. There was a university survey done of old people in various nursing homes. Clearly these people were at the end of their lives and they knew it. When asked what they regretted most looking back, the number one response was "paths not taken." That ranked well above "things I tried that ended badly." My wish for you is that you not let fear hold you back from something you would love to try. If it doesn't work out, you'll pick yourself up and try something new. But with the irreplaceable and priceless knowledge that you tried and learned something along the way. And, hey, it might even work out better than you ever imagined! Either way, isn't that better than to hang onto fear and never try at all? To regret the "paths not taken," seems a terrible price to pay for "security", which is such an illusion anyway! Happy Valentine's Day and may all your dreams come true in 2008! P.S. If you missed the Preview session I ran in January, you can listen to the recording here. Opportunities Find You When You're "Findable"
The living room gets added drama from Benjamin Moore HC-91 Danville Tan. The bedroom is pulled together with Benjamin Moore HC-114 Saybrook Sage. This spring will see a lot of condos sitting for too long in markets that were previously hot. Some agents cling to the belief that it's all about dollars per square foot. That might be true if buyers only shopped with logic. But they actually buy on emotion. It's really tough to make a condo stand out from the many others for sale in the same building. That's why home staging is so critical. Color recommendations are especially important as nothing warms up a space faster than the right coat of paint. 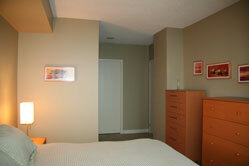 Most new condos are painted sterile white, which does nothing to enhance their often boxy environment. 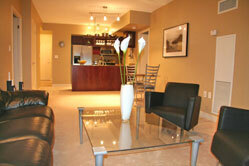 Look at the drama achieved in this typical condo livingroom. I used darker colors in both the living room and master (than I might use in many homes) because both faced south and were flooded with light from floor to ceiling windows on the 20th floor. There's nothing especially unique about the space or the furnishings, but the wall color pulls the look together. It lends the contemporary edge needed because of the young target market for that location. I have to say it's really nice reading an email like that! When I was working in the corporate sector it was rare to receive such heartfelt appreciation. Roman and his wife are now building a new life in Australia with way more c@sh than they would have had if they hadn't had their condo staged to sell. For more color ideas check out the Staging Diva Ultimate Color Guide. Did you notice how much stronger the above client testimonial is because of the results orientation? Learn how to get client testimonials like these from your clients. Opportunities Find You When You're "Findable"! I'm struck by the number of home stagers who still don't realize that THE place to get new business is the Internet. They waste m0ney on door-to-door flyers (where a response rate of 0.10% is considered good) or placing a single ad in the local paper (where 90% of the audience isn't moving now) and wonder why they're not getting enough business. * A real estate agent wants to present me to a small group of investors who have five brand new $1 million properties going on the market in the next 6 to 8 weeks that need complete staging. * A developer of high end retirement properties called to see if I'd be interested in putting the finishing decorating touches on all the public spaces of their new building. Total budget for accessories like vases, bowls, throw cushions, etc. is $23,000! Now that's a shopping trip I'm looking forward to! * The producer of a new HGTV series wants me to provide staged homes for their different episodes. A chance to feature my work. * A group of 8 California brokers invited me to be the guest speaker at their next "Mastermind" meeting. I'll explain why hiring a home stager is in their best interest and how to hire the right one in this completely unregulated industry, since there is no such thing as "accreditation" or "certification." * The director of another HGTV show I'm already working on needed background on the psychology of staging for the show. He was grateful for the hour I spent with him and so I took the opportunity to pitch him on my own show concept. After all, once you have a director on the phone, why waste the opportunity to turn it into something bigger!? To build a business you need to go out and find opportunities and you need to put yourself in situations where opportunities can find you! I created the Staging Diva Directory of Home Stagers so that Graduates would have an easy and low cost way to get on the Internet and be part of a site that I would drive traffic to for them. For example, I ran a campaign last week "Home Staging Offers Hope For Desperate Home Sellers" and within days had the Staging Diva Directory linked from about 1,800 other websites! This will create new opportunities for any stagers listed there. I'm still waiting for Better Homes & Gardens to run their staging story, which includes the Staging Diva Directory of Home Stagers. That's a 38 million circulation magazine! If you're not part of the Staging Diva Directory of Home Stagers and you're going to build your own website, there are 10 must have pages that you should start with. Here’s where you’ll talk about what home staging is and what markets you serve. Don’t forget to include your state or province. Remember website visitors come from all over the world and many city names are common between different states or provinces. You must write your own copy for this page or hire someone to do it for you. It’s plagiarism and copyright infringement to copy web content from someone else’s website and put it onto your own, unless you do so with their permission and you quote them. Taking what they have and changing an occasional word is still copyright infringement! Here’s where you’ll include portfolio-worthy before and after photos of homes you have staged or decorated. DO NOT USE STOCK PHOTOS as this practice misleads potential customers and will destroy your credibility if you get caught passing off someone else’s work as your own. If you haven’t had a paying client yet, shoot photos in your home or that of a friend if you’ve decorated it. The key here is that if you’re selling your decorating or staging talent, the photos must represent your own work. Here’s where you’ll include a photo of you and a profile of why you’re great at what you do, any experience you want to share, testimonials from a few clients. Don’t include a photo of you holding your child, it’s not relevant to the task of promoting yourself as a professional home stager and will in fact work against you. The photo of you is important because people hire people and they want to see who you are before phoning or emailing you. Remember that how well your website encourages people to contact you is highly dependent on how well you write about who you are and what you do. If the copy isn’t compelling, prospects won’t bother to call or email you. Don’t forget to make it easy for people to contact you. Include a phone number and email address (though to decrease spam you might want to include a contact us form that users complete rather than publishing your actual email address). It’s important to have a mailing address as well, but don’t put your home address on a website. Use a PO box or mail forwarding service instead. It’s a great idea to sprinkle testimonials around your website, but you should also have a page devoted exclusively to them. Testimonials have much greater weight and credibility if they include full names at a minimum. Also nice are photos, city and company names (if applicable). Read the rest of the story and find out what the other 5 must have pages are here. NEW Staging Diva Dialog Gets Your Questions Answered! I'm always looking for ways to provide ongoing support to as many Staging Diva Graduates as possible. There's already the Staging Diva Network Online Discussion Group, but not everyone wants to interact that way. Some just prefer the idea of being able to be on the phone with me in the give and take that comes with live interaction. Staging Diva Dialog is a NEW monthly Question and Answer call live with me on the third Thursday of every month, for Graduates only. And, I'll provide a recording of each call to all Staging Diva Dialog members in case they miss one of the live sessions, or just want to re-listen at their convenience. For a very limited time, I'm offering an introductory membership fee of only $47/month. Now is a great time to check out this new service at the lower fee, because if you want to remain a member, you'll continue at the same low rate for 2008! In March the price will go up to $57/month for anyone who hasn't joined yet and wants to. Congratulations to Staging Diva Graduate Patricia McArthur of McArthur Home Staging and Design (ON) who used her coaching time to put together a marketing plan to agents and developed a presentation for a group of 200 homeowners. We also developed an advertising and PR plan to support her public appearance. From Top Left: Suzanne Paro and Victoria Willits of Fresh Look Design (MD), Laura Jensen of Lakeshore Staging and Redesign LLC (WI), Amanda Freeman of Home Evolution (OR), Kimberly Nuzzaci of Moving Home Interiors (PA), Lynn Trostheim of Sassy Grass Interiors (BC), Venus Hamilton of Distinctive Touch (MD), Renee Bates of Renee Bates Designs (ON), Marlene Miller of Home Equity Designs (CA) and Jean Galvin of Essentially Staged LLC (FL). HOT TIP: Did you know that you can s.a.v.e. $90 by paying for your directory listing for a full year rather than month-to-month? Email if you'd like to switch and s.a.v.e! Congratulations to recent Graduate Stefanie Garritty, The Design Chic (AB) who is busy putting together pictures for her portfolio to join the Staging Diva Directory of Home Stagers. Within weeks of completing the program she registered domain names, received a business number and GST number, and writes, "I'm so excited to get going I can't even tell you!!! Thank you so much for helping me get started, your advice is gold!" Congratulations to Staging Diva Graduate Tiffiny Coffey (ID) of Scarlet Barn Interiors who got her first paying client from her listing in the Staging Diva Directory of Home Stagers. The client is based in California, but his non-selling home has been sitting on the market for 6 months in Tiffiny's Boise location. And, the client's real estate agent who happens to own a brokerage with 50 agents, asked her to look at some of his other listings and do a presentation at a staff meeting. So from this one project, MANY more will come. Way to go Tiffiny, obviously you made a great impression on this broker. Staging Diva Students and Graduates, send me your successes so we can celebrate your triumphs and inspire others! PLUS, being included in this newsletter gets you a F/ree home on StagingDivaDispatch.com (the more links I provide you with, the better for your business growth). "The housing bubble has popped. Never before have home prices fallen so broadly on a national level. There are more homes for sale and fewer buyers which means less money in the average seller's pocket. How can homeowners desperate to sell their home increase their chance of a quick and profitable sale in the current real estate market?" Read the rest of my story here; it's now on about 1,800 websites with a link back to the Staging Diva Directory of Home Stagers. If you're a Staging Diva Graduate who is serious about building your staging business and you are not part of the Directory yet, what are you waiting for? Builder Magazine interviewed me (last July) for a story about how staging offers home builders a cost-effective alternative to purchase incentives in a slow market. The story, "Spiff Up Your Standing Inventory: Builders share their strategies for moving houses that need to be sold or resold" is in the key January 2008 issue, the largest circulation month. You can read the full story here. It's a long feature, I'm on page 4 in the section Set the Stage, along with one of my staging photos. There is also an all important link now from BUILDER magazine's website to StagingDiva.com (links from major sites boost search engine ranking), which will help members of the Staging Diva Directory of Home Stagers. This story will help all home stagers market their services to the residential building industry. 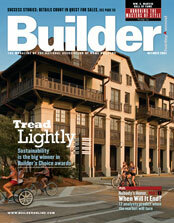 BUILDER is not only the LARGEST TRADE MAGAZINE in the United States, in August 2007 it was named "Magazine of the Year" beating BusinessWeek in the 80,000+ circulation category. I'm often on websites or in newspapers and magazines that I don't even know about. If you find something and you can provide a sample copy or the Internet link of a source I didn't know about, I'll send you a thank you gift! Read more about Staging Diva In The News and remember that all this coverage creates more staging project leads for Staging Diva Graduates. There are hundreds of home staging jobs posted in my blog. ®Staging Diva and the Staging Diva Logo are registered trademarks of Six Elements Inc.